The U10s commenced indoor training in Wallslough in February. The team worked on basic skills and techniques for 5 weeks which created ideal building blocks for the months ahead. In March they progressed nicely to our own local turf in Tom Ryall Park in Kilmanagh. Great credit must be given to all the lads for their dedication and commitment as the intensity picked up every week. 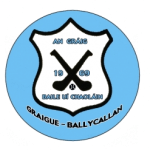 Their first match in April was against The Rower and what a way to start as they coasted home 5 – 4 to 1 -1 but tougher days were to come especially when they came up against a well-structured Dunnamaggin team in Kilmanagh in early May. Like all good teams though, they dug deep to bounce back and defeated a strong O’Loughlin’s team. At the early stage in the season the older players including Ben Young, Elliot Teehan and Padi Egan led the way and excelled in every match. But as the season progressed, more and more players grew in confidence and contributed strongly including Sean McGrath, Tony Butler and James O’Halloran. By May our games established a familiar format of 3 periods, commencing with ground hurling. Players were now becoming familiar and comfortable in their preferred positions and as result we ran out easy winners over Clara and Bennettsbridge. 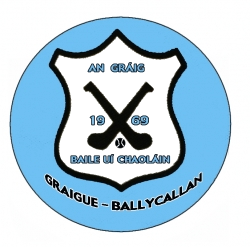 In July, Graigue hosted and won a mini Blitz in Kilmanagh, defeating clubs such as Ballyhale, Tullaroan and Freshford. 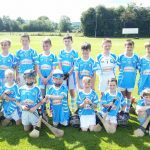 As all on the panel know and appreciate, hurling is a team game and different lads came to the fore each day and by mid-summer Frank McCluskey, Aidan Comerford, Donnacha Cleere, Robbie Tector, Cillian Hoyne and Chris Mahony were in full flight. The younger players Shane Cody, JJ Maher, Eoghan Cahill, and Robbie Lynch will no doubt continue to excel next season while remaining at under tens. We took part in two more blitz, one in O’Loughlins and another in Tullaroan. Graigue reached the latter stages of each competition, and even though we were ultimately defeated, the team played great and enjoyed the challenges presented. Throughout the season, each player has worked very hard to develop their own skill set and are now playing at their best level yet. More importantly, a great comaraderie has developed amongst the squad, with each player working to support each other. A special word of thanks to our two top coaches- Niall Egan and Billy Young. Both coaches gave very generously of their time and expertise throughout the year and were always very fair, encouraging and thorough with every player. Lastly on behalf of the under 10 Squad and Coaches, a special thanks to Maurice Ronan for his co-operation and ensuring the pitch was always available and in top condition. James O’Halloran, Paidi Egan, Elliot Teehan, Sean McGrath, Aidan Comerford, Ben Young, Cillian Hoyne, Eoghan Cahill, Shane Cody, Frank McCluskey, Tony Butler, Donnacha Cleere, JJ Maher, Robbie Lynch, Chris Mahoney and Robbie Tector.